Our presentation skills training courses are designed with one aim. To ensure you leave a far more confident and capable presenter. Each of us develops our own individual style of presenting over time. However, the basics of good, memorable communciation remain the same, whatever your particular style. Our experienced instructors will show you how to engage with your audience and ensure your message comes through loud and clear. We also look carefully at how to prepare for a presentation. A large portion of it’s success will be determined by what and how you prepare. We offer training at our centres in Guildford, London, Manchester and also at our client’s sites. Many client’s find it more convenient to ask us to come to their site to provide training. Learn to communicate in a way that is unique and authentic to you whilst ensuring that your message is heard exactly the way that you intend it to be. Public speaking can be fun. 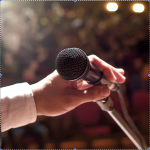 Conquer your fear of public speaking and learn how to make an engaging, entertaining presentation. 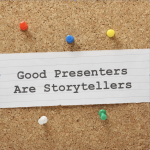 Good presentation skills allow you to communicate your message clearly whoever your audience is. They include things like the use of visual aids, using and changing the tone and volume of your voice and how you structure your presentation. Presentation skills are not theoretical. They are a practical expertise that is only developed through deliberate practice. This means that our classes are very hands-on. They will involve you making a number of brief presentations. You put into practice the techniques that the trainer has explained to you and learn how to implement them in real life scenarios. While we do cover the theoretical ideas that underpin good presenting, we are focused on ensuring that you leave your class with real-life skills. We have centres in London and Guildford where we run scheduled presentation courses. We also frequently provide courses at our clients’ offices.